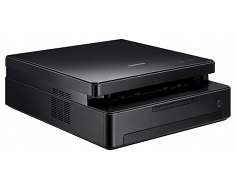 The Samsung ML-1630 is a compact black and white laser printer that Samsung calls sleek, silent and the smallest laser printer in the world. This printer, which was designed specifically for personal home use, is targeted to consumers who desire laser printer functionality and a cutting edge design that will go with higher-end designer home decor. The manufacturer also boasts fast print speeds and top notch quality, all in a low profile package that is less than 5 inches high. The Samsung ML-1630 has a top print speed of 17 pages per minute, which is ideal for the small-volume printing needs of the personal home user. This printer can tackle basic jobs such as homework assignments, letters to friends and family and printing web page content for reference. A desktop form factor that is 13” wide, 14.8” deep and only 4.8” high, and weighing only 14.1 pounds, makes this one of the smallest and lightest laser printers on the market, ideal for use in limited work space and easily portable. USB connectivity is included for direct connection to all types of computer systems, being one of the most widely used and supported connection interfaces in the world. Maximum achievable print resolution is 1,200 x 600 dots per inch, providing decent quality text document printing results. The first page out time is 15 seconds for this model, minimizing wait times for print jobs to be completed, whether they be single page or multiple page documents. A 100 sheet multipurpose paper tray comes standard, allowing for 6 minutes of document printing at top speed without having to reload the paper tray. Maximum installed page RAM is 8 MB, which is sufficient for printing text documents without having to deal with unnecessary printer pauses due to memory overload. 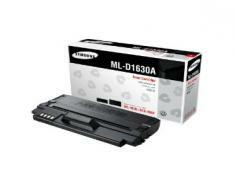 The Samsung ML-1630 supports a decent range of media types and sizes. Media types include card stock, labels, envelopes, plain paper and transparencies. Permissible media sizes range from 3 x 5 in. card stock to 8.5 x 11 in. letter size paper. A membrane keypad, bright blue status LED's and melodic alert tones offer a certain convenience and functionality to a stylish design. The simple design of the print mechanism makes clearing paper jams easy, minimizing down times and delays for people who are on the go and need fast results. The rated monthly duty cycle is approximately 5,000 pages per month, which exceeds the capabilities of the normal home user. Windows 2000, XP, 2003 Server and Vista operating systems are supported, as well as Mac OS X and various builds of Linux. 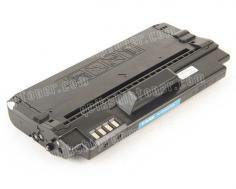 This model also features quiet operation, with a maximum noise level of 45 dBA when printing. The maximum print speed of the Samsung ML-1630, although advertised by the manufacturer as fast, is on the lower end of the performance spectrum when compared to other personal laser printers in this class. Network connectivity is not an option with this model, so connection to a home Ethernet network is not possible. Printer sharing must be configured through the Windows operating system that is installed on the computer that this device is directly connected to. Legal paper sizes are not supported by this printer, which limits small business or home office use, and affirms that this model was targeted specifically to personal home users. An output tray capacity of only 30 sheets severely limits this printer's volume capabilities to very small unattended output. At top print speeds, it takes just a little over 2 minutes to fill the output tray. Although Samsung advertises this model as one that is ready to handle work, the limited capabilities and rated capacities do not support anything more than occasional, small-volume print jobs. Review it: "Samsung ML-1630 "
The Samsung ML-1630 is shipped with a starter toner cartridge, in a single unit, with an average yield capacity of 1,000 pages. Replacement toner cartridges can be purchased, also in black only, with a rated average yield capacity of 2,000 pages. Both rated values are at the standard 5% page coverage rate.